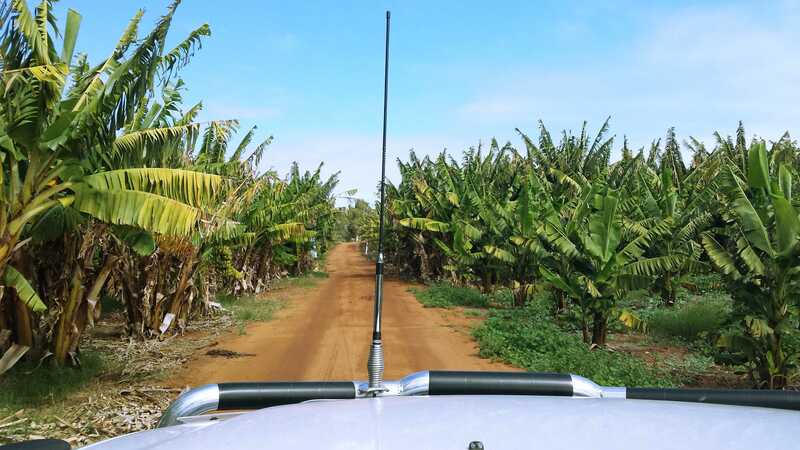 Hindsight… Throughout the past dozen years of my city living – highrise dwelling – office life I dreamed of a gypsy-like roadtrip around Australia and simple country life. A year later, living my dream life in reality I can report it’s nothing like I thought. Some aspects have been far more difficult, others far more wonderful. 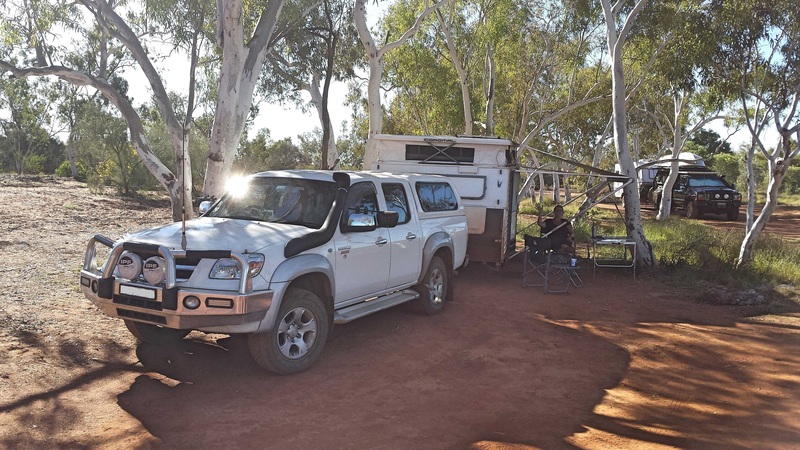 For instance, my blog blurb states “Part of that dream is also to hook up a caravan to our ute and explore Australia.” It once also had the words “and blog about it as we go” tagged on the end. When it came to life on the road I couldn’t manage productive online time, only a single life as art blog post from Broome, NT on 12 August; 59 days into our trip, coincidentally the half way point. I did manage 118 days -the duration of our travels around Australia- of Instagram posts. My fellow Instagrammers were marvellous company throughout the trip and provided welcome constancy and connection to balance my ever-changing days. In planning and setting off on our trip we never had a fixed route-timetable. As a mud-map we were following a motorcycle ride the G.O. had done from Darwin to Perth via Broome over 40 years earlier and revisiting a short holiday we’d taken together in 2007 to Broome & Darwin. We estimated we’d be away for three-four-maybe five months dependent on ennui, funds, weather. 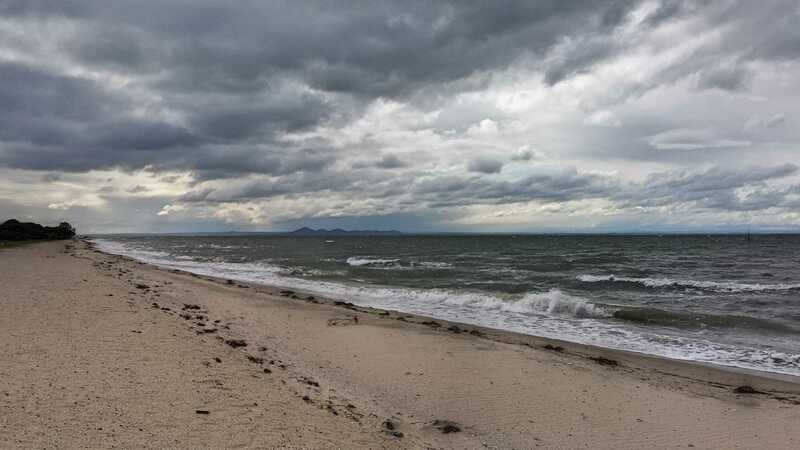 As it turned out all those factors became connected and under consideration as we left the north of the west coast and the dry season to encounter an unusually long, cold Australian winter season firmly entrenched down south. 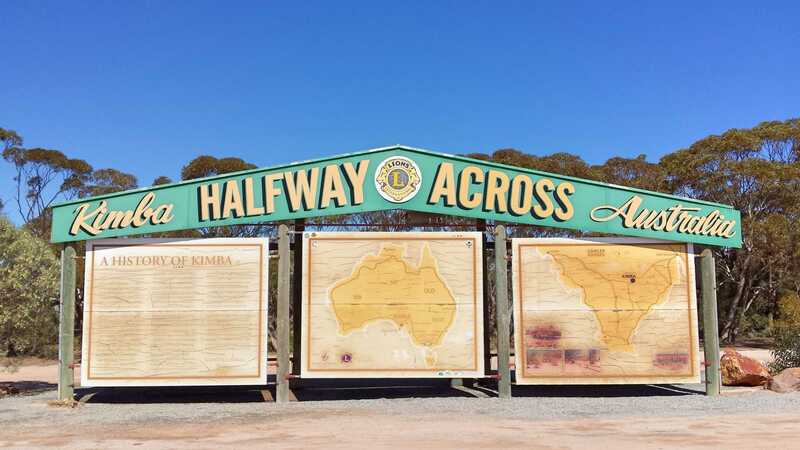 From Broome, we journeyed in a southerly direction -along the far side of Australia- following the West Coast to Perth, across South Australia to Victoria where a stopover in Portland connected our travels to the trip we did in March. An additional -unconsidered- factor turned out to be the G.O.’s bad knee which has worsened over the years and ultimately hit its tipping point via a long sunset walk along Cable Beach at Broome completed a little too quickly as daylight rapidly diminished. It was going to happen eventually but the timing was unfortunate. Despite him stoically nursing the injury it became apparent in combination with the other factors it was nigh time to head home, and save leisurely exploration of the south for a future trip. Below is a selection of photos from the second leg of our trip. Just south of Broome, WA is Eighty Mile Beach. 129 kilometres of waves, sand and shells. A Must Do for fisher-people, beach bums and shell seekers. There’s no doubt that Red Dog (of the Pilbara) c. 1971 – 21 November 1979 featured in the 2011 film of the same name is well-loved. 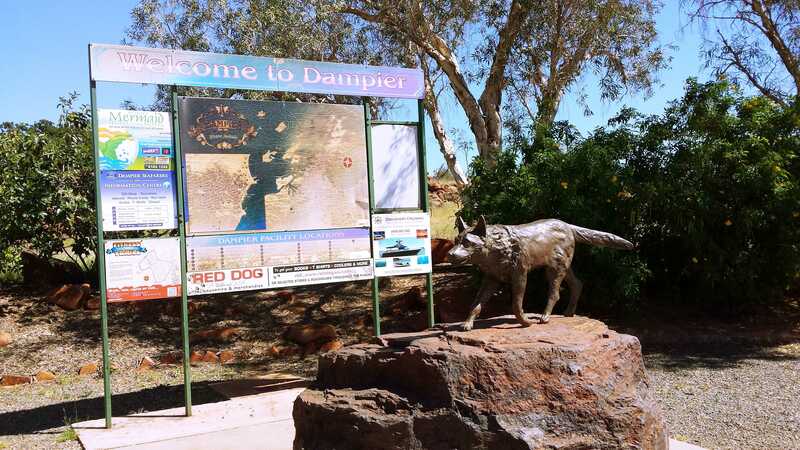 His statue in Dampier, WA is shiny & smooth from being stroked. We contributed our pats. A regular refrain on our trip was Let’s Just Have a Look. Which is how we came to explore the previously unknown to us and stunning but chilly-on-the-day Cape Range National Park near Exmouth WA. Feeling very much at home among the bananas. Proximity and availability -in August- of fresh tropical produce via farm gate stalls made Carnarvon, WA a foodie highlight. 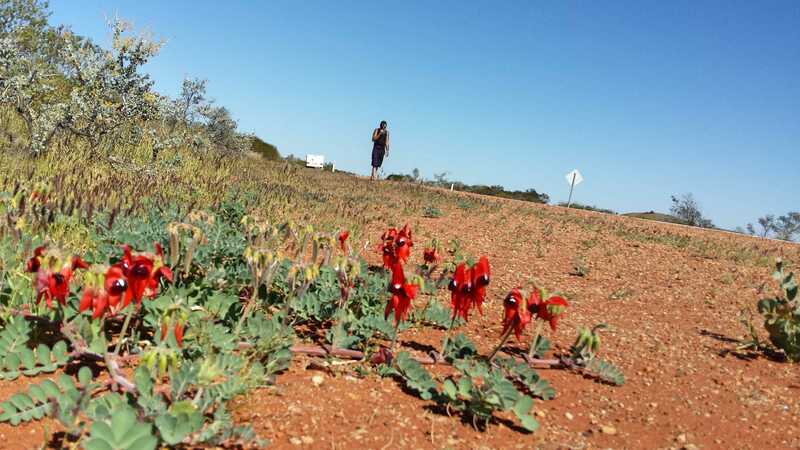 Did we see the famous Western Australia springtime wildflowers? Couldn’t miss them! However, we almost missed Monkey Mia, WA because I didn’t connect its location with nearby town Denham and the legendary Shark Bay. Which would’ve been a shame as it is one of our of Must Return To places. 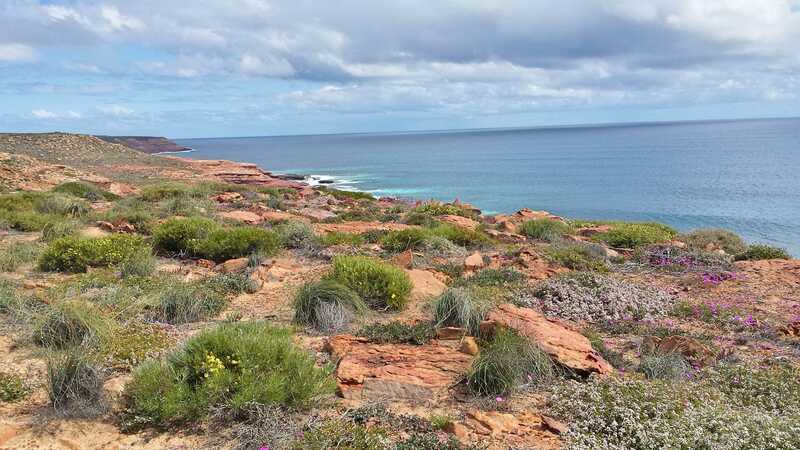 Nor had we heard of Kalbarri National Park, WA famous for its coastline and wildflowers. Unmissable thanks to our fellow travellers. Never too old or too late for hero-worship. 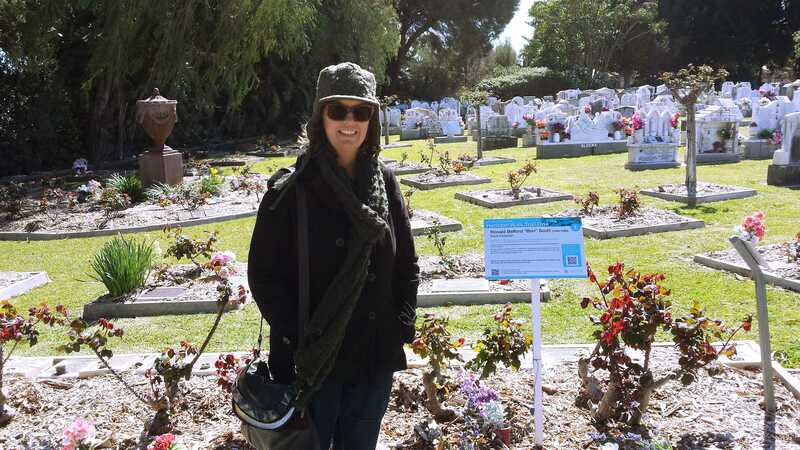 Ignoring imperfect Perth weather we paid our respects at the final resting place in nearby Freemantle of Bon Scott (9 July 1946 – 19 February 1980) a Scottish-born Australian rock musician, best known for being the lead singer and lyricist of Australian hard rock band AC/DC. R.I.P. Western Australia’s south offered many redeeming features as solace to the unseasonable season. The charms of Margaret River and Watershed Winery & Restaurant outshone inclement weather. 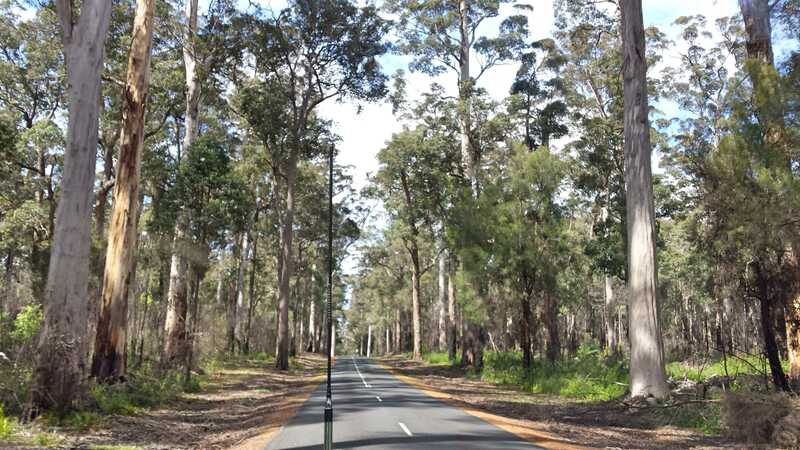 After enjoying the hospitality of Glenda & Maureen our friends of the Passion Fruit Garden blog, in beautiful Bridgetown, WA, we had a taste of the majesty of the native forests around the South Western Highway for which we will make a future return trip. 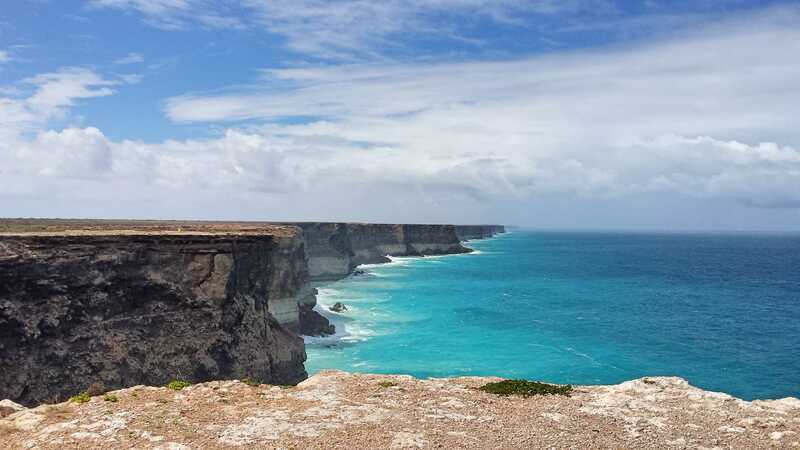 A roadtrip across the Nullarbor rates high on the traveller To-Do List along with the Great Australian Bight, en route. Standing in this spot was a trophy moment. 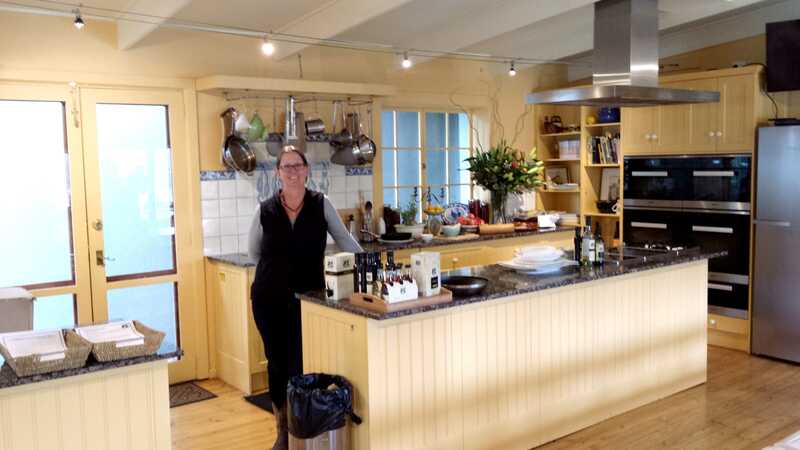 Another wild wet weather day another pilgrimage… Maggie Beer’s Kitchen (location of the TV series The Cook & The Chef) in the Barossa Valley, SA was warm and dry. Suitably stormy weather on the Fleurieu Peninsula, SA for a family history mission from Dad to find Currency Creek Cemetery and the grave (far LHS) of Herbert Newling Barker who died 1881 aged 11 years 8 months. R.I.P. No point in attempting to outrun the weather, the journey and destination became one along the western volcanic plains and Victoria’s Princes Highway, home to numerous and impressive networks of dry stone walls. Batten down the hatches part 2 in Portarlington, Victoria. A week earlier we’d been in the midst of the controversial #adelaidestorm. Throughout it all the nannavan didn’t leak a drop. 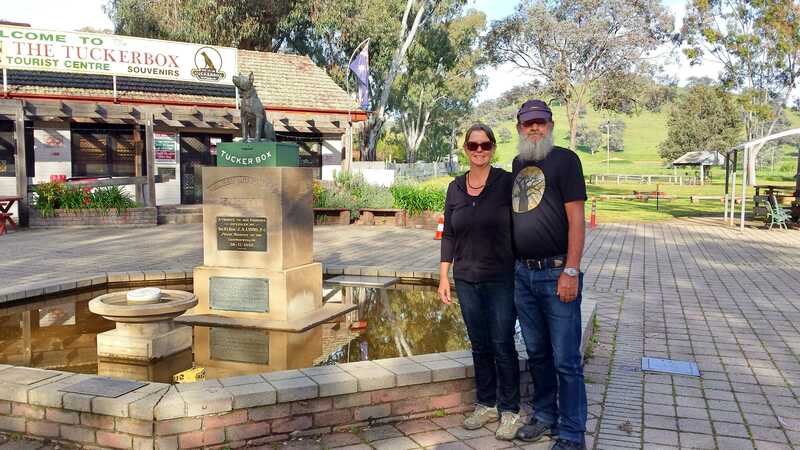 Dog lovers, we couldn’t drive past the statue of the Dog On The Tuckerbox, five miles from Gundagai, NSW inspired by a bullock drover’s poem, Bullocky Bill, which celebrates the life of an allegorical drover’s dog that loyally guarded the man’s tuckerbox (lunchbox) until death. 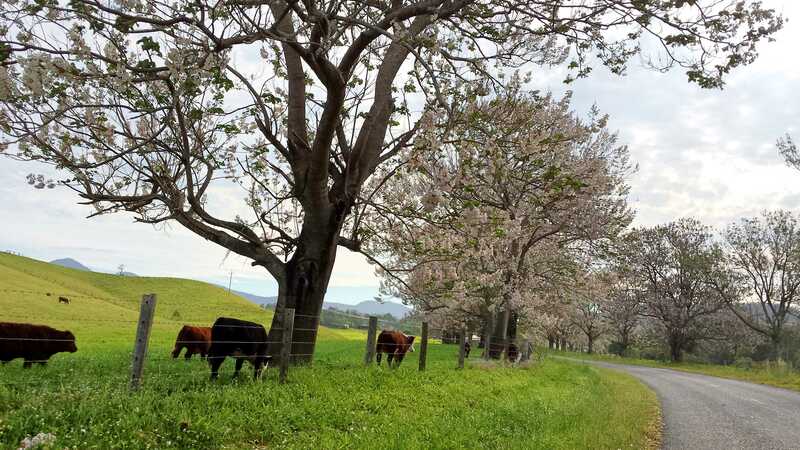 Day 118: the home straight into Taylors Arm village lined with flowering Paulownia trees and fat cattle. At our first fuel-up at Dalby, Queensland the speedo read 160112 kilometres. In between we travelled through the Northern Territory, Western Australia, South Australia and Victoria. Our last fuel-up was at Pheasants Nest, NSW where the speedo read 180390 kilometres. The second leg: Broome to our last stopover at Dad’s in Lochinvar before driving the very familiar 360 kilometres of Pacific Highway north to Taylors Arm. We’ve been home for two four six eight busy weeks, and pencilled in a staycation to recover from our holiday and its aftermath. Future blog posts [under my new daleleelife101.blog banner] and visits are in the pipeline but in the meantime for glimpses of our everyday life you can see my Instagram snapshots on the right (hover cursor over the pics for the captions) or if you’re an Instagrammer you can follow me at daleleelife101 and the G.O. at welshy055. *The Far Side was a single-panel cartoon series, often surreal and anthropomorphic, created by Gary Larsen that was syndicated internationally to over 1,900 newspapers from 1980 for fifteen years. P.S. If you think of it, would you please advise via Comments if this blog post appeared via email notification or in your Reader, as since changing to .blog it didn’t appear in my Reader until I unfollowed then followed. Thank you. This entry was posted in Blog and tagged Australia, my life, travel. Welcome back to bloglandia Dale. I missed you and wondered what was happening. Great shots of your trip. You are looknig rather gamourous too. Definitely worth it, I should think. Wonderful photos! Thank you. I’d do it all again in a heartbeat… after I have a rest. I’m sure time passing has sped up, and did more so while travelling. It is wonderful country and I’m so grateful we gave ourselves the opportunity to explore it. Subtly I think I have returned more centred and with a different perspective both about the country, and myself. I think that travel does that, as you already know…just opens things up in all directions while centering at the same time. It is such an interesting thing! Thank you for reading – it was so lovely to be able to sit, cobble together a selection photos (out of 25 GB worth!) & write a blog post. For me the travel and indeed this new life is still a mixed bag of challenge & reward. The remote areas were the highlight and future trips will gravitate toward them. Wayne has an appointment with the specialist next week so we’ll know more then. Wow, EllaDee! Great shots. Yes, I got an email. Thank you. I hope when I’m able to make time stretch a bit further that I can do a series of posts with photos about the trip. I love vicarious travel so it’s only fair I think to contribute my share. Stunning pictures, what a trip it must have been. You have something to really look forward too one day now. Thank you. It’s a trip I’m very grateful to have been able to do, and all being well one day we’ll have the opportunity to do it anew. Welcome back to bloglife. I’ve loved the photos, but I’ve missed the ‘voice’. I hope the G.O. has given his knee enough rest to let it recover, but I suspect not…. I got an email notification and you appeared in my Reader, so all is well from my point of view. Let’s have a Skype some time this coming week, if you’re free? Thank you. The ‘voice’ has missed being able get its thoughts out of my head and onto a screen but incrementally we’re approaching a settled everyday life. Doing this one blog post has felt like quite an achievement. Skype would be lovely. It is lovely to be home, settled and not leaving again for a while means we can enjoy the fruits of our labours. Much of the country we travelled was flat. I come from and we now live in hills so it’s very novel for me to see such flat land, and that sheer drop off into the ocean is amazing. One of the things I’m enjoying about being home, living in just one place is when I do work around the house & garden I get to stay around and appreciate it. I loved following your trip on Instagram, but as Kate says, it is lovely to have your voice too! Welcome back. Such a shame about the GO’s knee, for so many reasons. He will be a new man once it is fixed and you will be off on the next adventure in the nanavan. Sorry, also meant to say that I received email notification. I haven’t looked in the reader, but I guess it is there. Thank you. I think it is just my new WordPress identity causing glitches, I had a comment earlier today go into Waiting for Moderation. Thank you. I don’t usually use reader but I follow my own blog so I can check everything is working. I have hundreds of blog post email notifications waiting to be caught up on. Much as I loved the trip the one thing I missed was blog visits. Welcome back, Miss Dale. So glad to read you again. I don’t have an instragram account, so I missed the updates on your travel. Loved seeing the photos. I have no idea where these places are in Australia, but that one you called “Nullabar” was breathtaking. It looked so barren. Was there anything around there? I hope G.O’s knee is healing. Enjoyed reading about your trip. Thank you. The Nullabor (where highway the links Perth with Adelaide) is barren but a rich & scenic landscape in its own way. There are a few roadhouses for fuel, basic food & accommodation but not much else. Driving across it is a very cool experience. I love it – the idea that your friend is 70, rents her house and travels solo FULL-TIME!! Can you imagine women doing that years ago? No Way! I loved that one of my sons told he how he’d told one of his friends that I’d be fine traveling solo because I’m independent & ‘I’m only 66’!! ; o ) And I’m also glad to hear that you met lots of people traveling solo !!! Looks like I’m not alone with plans of doing just that. Thank you. Tardy is my middle name at the moment! We are settling in… more on that shortly. 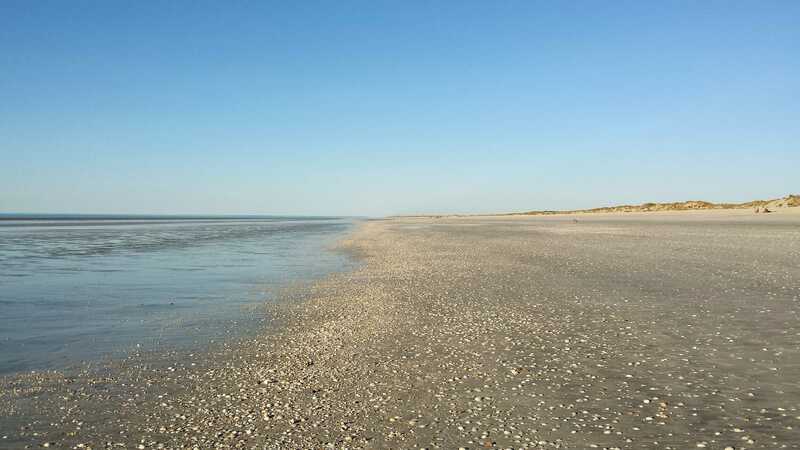 Not the whole of Cable Beach – it is very long, just the end towards Gantheaume Point. Far enough but ok had we set out earlier for an afternoon walk rather than sunset and dawdling taking photos and shell seeking. Welcome back Dale, I missed your stories. What an amazing road trip. I hope the G.O ‘s knee is getting better soon. Thank you. We’ve settled back in. I have some blog reading and baking to catch up on… and plan to use my staycation time to my benefit. The G.O.’s knee isn’t as bad as it could’ve been but till seeking medical info. What a wonderful trip. I got the notice via my email. So sorry about the bad knee cutting things short. Great pictures and an adventure. Thank you. We were fortunate to do & see what we did. Indeed a great adventure.